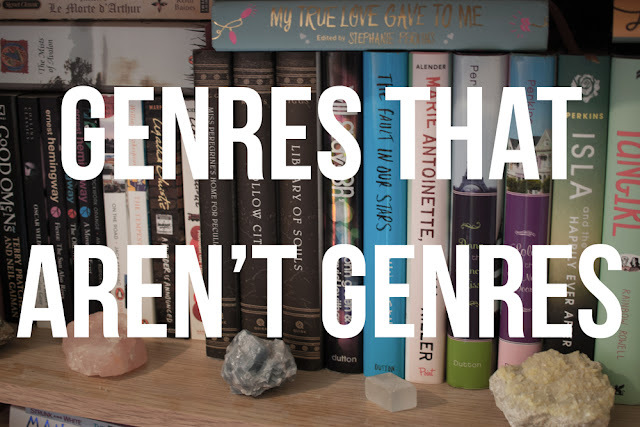 I was talking to a writer friend of mine on Twitter recently about how frustrating it is when people refer to YA as a genre and it soon turned into us joking about the other 'genres' out there that aren't really genres. YA is, perhaps, the most frequent victim of this particular kind of misunderstanding. Young Adult is an age group, and within it there are books of so many different genres, but I guess because it has its own section in the bookshop and a lot of the same themes show up across the different genres, people get confused. Still, it isn't its own genre. Worse than this though, in my opinion, is 'Women's Fiction'. What is Women's Fiction? Is it fiction written by women? Are Jane Eyre, The Secret History, and Murder on the Orient Express all Women's Fiction? Or is Women's Fiction books written for women? This makes even less sense to me because, as we all really know, not all women like the same things, and there is nothing stopping anyone who isn't a woman from enjoying things that are traditionally thought of as 'for women'. Of course we all know that what Women's Fiction really means is 'Romance Fiction', like it's physically impossible for men to read or write romance. I have never seen anyone refer to David Nicholls as a writer of Women's Fiction but I can't help but wonder, if One Day had been written by a women, would it be classified as Women's Fiction? Then there's LGBT Fiction. This one I do understand as there just aren't as many novels that feature LGBT protagonists as there should be, and a lot of readers want a way to easily find those that do. But again, is this actually a genre? Or is it, like Young Adult and Women's Fiction, really a marketing target group? Surely a lot of LGBT books could also be classified in genres like Romance, or Literary, or any of the other genres that actually are genres? Maybe if more writers wrote books with LGBT protagonists, that would be the case. Maybe in the future it will be. What do you think? Do you think I'm wrong and that any of these are and should be genres? Are there any more 'genres that aren't genres' that annoy you as much as Women's Fiction clearly annoys me? Let me know in the comments!